No doubt you’ve heard the old joke, “How does one get to Carnegie Hall?” What’s the answer? Practice, practice, practice. If you are a musician, athlete, actor, writer, poet or artist, practice is an absolute necessity. Other people “practice” law or medicine. All of us have practices that frame our lives. These practices usually take the form of both positive and negative habits, ways, or actions in which we engage on a daily basis. Practice is a process. It’s how we go about reaching a destination or a goal. For Christians spiritual practices are a way in which we deepen our relationship with Christ. John Wesley said that these spiritual practices are a means of grace. When we are intentional and deliberate in the desire to grow in our spiritual life, God’s grace meets us at every corner. During Lent we traditionally “give up” something or add a specific spiritual practice to our life. This Lent I am attempting to practice forgiveness, which is more difficult than any other spiritual discipline because it challenges our very nature to judge and assert our moral and spiritual superiority over others. Forgiveness is a spiritual discipline that requires the fashionable yet counter-cultural act of practice, practice, practice in order to mature in our faith. Isn’t it amazing how many news stories today relate in some way to forgiveness? Brian Williams, anchor of NBC Nightly News since 2004, has been one of the most respected and popular newscasters in our country, attracting 9.3 million viewers every night. On January 30 Williams broadcast a segment in which he was shown at a New York Rangers hockey game. During the game there was a tribute to a retiring command sergeant major, who, Brian Williams suggested, had evacuated him from a dangerous situation in Iraq. It turns out Williams was not in that helicopter but arrived later. 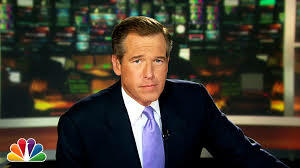 He broadcast an apology on February 4 and took himself off Nightly News for a week. On February 11 Williams was suspended without pay for six months. Was Brian Williams’ suspension too harsh? Are Americans always out to bring down our heroes? After all, everyone tends to exaggerate at times, and stories grow in the re-telling. Human nature is to puff ourselves up so that we can seem more important than we really are. On the other hand, it’s part of the military code of honor that you don’t mess around with war stories. If you weren’t actually in combat, don’t disrespect other soldiers by saying that you were. Should we forgive and give another chance to Williams, a person who has told hundreds of stories over the years and has been a very trusted reporter and anchor? Should the Christian response should be one of forgiveness, reconciliation and restoration rather than the breaking of relationship? In response to the controversy over Brian Williams’ remarks, David Brooks wrote a column for the Op-Ed page of the February 10 New York Times. In the column, entitled The Act of Rigorous Forgiveness, Brooks offers a four step process to achieve reconciliation and restoration in any situation. Mercy is the default for humans. God shows us unending mercy. Therefore, we ought to show mercy to others. “We are all sinners,” Brooks writes. “We expect sin, empathize with sin and are slow to think ourselves superior. The forgiving person is strong enough to display anger and resentment toward the person who has wronged her, but she is also strong enough to give away that anger and resentment. In this view, the forgiving person makes the first move, even before the offender has asked. She resists the natural urge for vengeance. Instead, she creates a welcoming context in which the offender can confess.” When was the last time you made the first move, showing pre-emptive mercy to another? No two wrongs are the same. So we must carefully evaluate each wrong before rendering judgment and forgiving. “What is the character of the person in question?” writes Brooks. “Should a period of stupidity eclipse a record of decency? It’s also an occasion to investigate each unique circumstance, the nature of each sin that was committed and the implied remedy to that sin. Some sins like bigotry are like stains.They can only be expunged by apology and cleansing. Some like stealing are like a debt. They can only be rectified by repaying. Some, like adultery, are more like treason than like crime; they can only be rectified by slowly reweaving relationships. Some sins like vanity – Williams’s sin – can only be treated by extreme self-abasement.” How do you humbly judge others through prayerful discernment? It’s often important for the person who has been harmed to make the first move. However, as Brooks writes, “At some point the offender has to get out in front of the process, being more self-critical than anyone else around him. He has to probe down to the root of his error, offer a confession more complete than expected. He has to put public reputation and career on the back burner and come up with a course that will move him toward his own emotional and spiritual recovery, to become strongest in the weakest places.” Are you willing to engage in the hard work of self-examination and honest confession? The church is called to lead in the forgiveness arena, yet too often we are known for our meanness, fights and exclusion rather than grace. We have much to learn from observing how ordinary people are able to fashionably and counter-culturally forgive and receive forgiveness. Whom will you forgive this Lent? From whom will you ask for forgiveness this Lent? What kind of person do you want to become? Practice, practice, practice. It is clear that Christ tells us to love God and to love our neighbor. When we love of our neighbor, forgiveness must follow, just as God forgives us. When the time comes, God will judge everyone, including me. Thanks, Laurie, for helping us wrestle with tough issues.